Everybody apparently rides a motorbike in the cities of Vietnam. Here in Hanoi, poncho-clad motorbikers barely seem to notice the downpour as they forge ahead. Motorbikes, motorbikes, motorbikes. My next lasting impression of Vietnam was being surrounded by motorbikes on the busy urban streets and highways of Hanoi...more motorbikes than I had ever seen in one place before. Everyone--from stiletto-heeled young women to old men carrying loads of produce to four-year old children sandwiched between their parents--was riding on a motorbike. And they were all riding as fast as they could, where ever they were going, squeezing between and around cars. If you're a pedestrian in Hanoi or Ho Chi Minh city (aka Saigon), beware! Motorbikes will jump the curbs and take over the sidewalks if there isn't enough room on the streets. More than once, I had to flatten myself against the side of a building to avoid an onrush of motorbikers with complete disregard for pedestrians. The image of these motorbikers best symbolize Vietnam for me: Aggressively on the move, speeding, and ignoring the rights of others. But it's unclear where, collectively, the country is headed. The air pollution is suffocating, the heat stifling. And Vietnam is one of the most at-risk countries for climate change. Vietnam War impacts. If you are old enough to remember the Vietnam War, you remember when there was South Vietnam, an ally of the United States, and communist North Vietnam, the enemy of the U.S. during the war. After the war ended in 1973 with the U.S. withdrawing from Vietnam, reunification was completed in 1975. Since then, there is only one Vietnam, a communist country. Most people who live in Vietnam today are too young to have directly experienced the Vietnam War, but the toll of the war on both the people and the land of was devastating. Both north and south Vietnam suffered intensive U.S. bombing and chemical spraying of Agent Orange, Napalm, and other toxic defoliants throughout the countryside. Chemical defoliants were used to kill off huge tracts of forest so that there would be no place for the Viet Cong to hide. The strategy didn't work very well, but it was very effective in destroying vast forest ecosystems. A very clear summary of how all this works is provided in the magazine Teenink [ http://www.teenink.com/hot_topics/environment/article/4361/The-Devastating-Ecological-Effects-of-the-Vietnam-War/] Destruction of forests by the spraying of chemical defoliants in Vietnam has undoubtedly reduced the capability of these forests to store and absorb carbon, which exacerbates climate change. At the same time, Vietnam's extended coast-line along the South China Sea makes it vulnerable to sea-level rise, resulting from climate change. First stop: Hanoi. Hanoi, the capital of Vietnam, with a population of some six million people, still shows a heavy French influence in its shaded boulevards, verdant public parks and thriving Old Quarter. . . not surprising, given that France occupied Vietnam from 1887 until 1941. Hoan Kiem Lake lies within the city, is bordered with both modern office buildings, old Buddhist temples, and crisscrossed by a maze of ancient streets full of motorbikes and lively markets. As a westerner shopping in the street markets, be prepared to be pursued aggressively by shop vendors. "Madame, madame, madame..." they would beckon, waving merchandise in my face. I suppose this tactic actually works on some potential buyers, but it drove me away. Halong Bay. From Hanoi we traveled to Halong Bay, a secluded harbor within the Gulf of Tonkin on the South China Sea. There are some 2,000 limestone islands rising from the bay, and they form countless beaches, caves and grottos. We cruised on an overnight junk through Halong Bay, which is a top tourist destination in Vietnam and a World Heritage Sight. Hue. We then boarded an overnight train to Hue. The crowded rickety train was an "experience", though the experience did not include a good night's sleep. 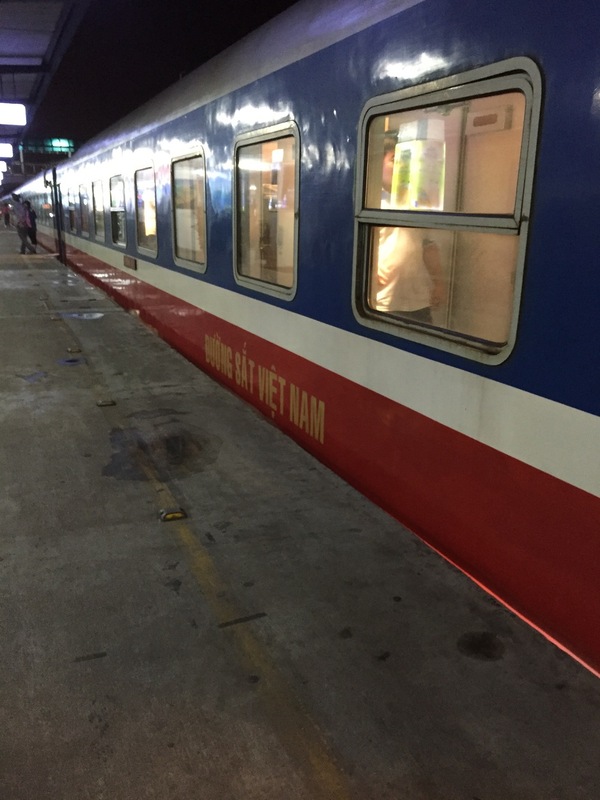 We traveled overnight on very basic train from Hanoi to the city of Hue. Hue, the ultimate gated community. Hue, the former imperial capital of Vietnam, contains the architectural remnants and treasures Vietnam's royal past within the Imperial Citadel and the Forbidden Purple City. Former kings and royal families lived in splendor inside the ultimate gated community here, completely oblivious to the terrible conditions of their subjects outside. Still on display are vestiges of the wealth and privilege of these dynasties. A cabinet full of gold-embroidered silk robes, offering former royal inhabitants of the Imperial City a complete choice of daily wear, arranged by color. The Forbidden Purple City was almost totally destroyed during the Vietnam War's Tet Offensive. The ruins that are still standing have countless holes left by bombs and a long process of restoration is underway. Ruins of the ancient Imperial City fortress in Hue, north Vietnam, heavily bombed by the U.S. during the Vietnam War. Restoration is still underway. If you can't beat 'em, join 'em. In Hue I found myself succumbing to peer pressure and was persuaded to get on the back of a motorbike to tour the city. Our tour guide had hired a whole team of motorbike drivers who knew how to maneuver the streets and the backroads. Frankly, I felt safer on the motorbike than I had as a pedestrian. In Hue, we visited Thien Mu Pagoda, an active Buddhist monastery that was built in 1601. This is me standing in front of the city of Hue's famous Thien Mu Pagoda. The pagoda lies within an active Buddhist monastery that was built in 1601. On display at the monastery is a car belonging to a former monk who in 1963 drove to Saigon and set himself on fire to protest the treatment of Buddhists by the South Vietnamese regime. The car that the Buddhist monk Thich Quang Duc drove to a major intersection in Saigon on June 11, 1963 and burned himself to death in front of crowds of people, in protest of Vietnamese policies of discrimination against Buddhists. Several films of this iconic social statement are posted on YouTube. Next we took a scenic drive through the mountains to Da Nang and China Beach, on of Vietnam's most beautiful beaches. U.S. troops came to China Beach during the Vietnam War for R & R. Now, much of the region is covered with hundreds of huge sprawling resorts, most of which seemed completely deserted. Apparently, Chinese developers have invested heavily in the development of these resorts. China Beach at Da Nang. Crossing a bridge into Da Nang, now highly developed with beach resorts. Bullet-hole riddled wall of an old bunker near Danang. Hoi An. Another old city Hoi An, was our next destination. It's a picturesque and quaint town in some ways, but it now seems to serve the tourist industry more than anything else. There are countless shops selling clothes, T-shirts, jewelry, etc. Strangely, most of the shops sell the same merchandise, which apparently comes from the same distributor. So, you don't need to go to more than a few stalls to see the entire inventory. The picturesque city of Hoi An is a thriving tourist destination, full of shops that oddly all contain the same inventory of merchandise for sale. One morning our guide hired bicycles and he took eight of us on a bike ride through the countryside around Hoi An. This was a great way to see a more authentic side of the city. Farmer with bicycle outside the city of Hoi An. The area has beautiful residences with extensive vegetable gardens, as well as commercial farms. View into a country house outside of the city of Hoi An. Ho Chi Minh City (formerly Saigon). Our final destination in Vietnam was the former capital of South Vietnam, Saigon, which was renamed Ho Chi Minh City after the reunification in 1975. Vietnam War Museum. A visit to the Vietnam War Museum in Ho Chi Minh City is a must. (It's called the "War Remnants Museum"). As long as you don't expect a "balanced" perspective of the war, the displays are moving, informative, and particularly good at conveying the horrors of the Vietnam War. Many of the museum displays included pieces from American newspapers and magazines covering both the war protest movement in the U.S. and throughout the international community. And then there were displays exposing the undeniable ravages of the war, which also featured incredible photo-journalism from U.S. newspapers and magazines. There was a powerfully disturbing exhibition about the impact of the US spraying of the chemical defoliants Agent Orange and Napalm during the war. There were entire rooms of life-size photographs of Vietnamese people who had been maimed by Agent Orange, and people who were born malformed because of exposure by their parents to the chemical. The exhibit also showed some of the ecological damage caused by the spraying of Agent Orange. Most of these horrific impacts portrayed in the exhibit are confirmed by post-war reports in the US about the impacts of Agent Orange. Another interesting site in Ho Chi Minh City is the Hotel Continental, which was built during the French occupation, and has been refurbished several times. During the Vietnam War, the hotel was news central for journalists reporting on the war. It was then named the Continental Palace. During the Vietnam War, the Hotel Continental Saigon (then called the Continental Palace) was news central for American journalists from publications like Newsweek and magazines whose news bureaus were located there. Crocodile skin products for sale. My last parting shot of Ho Chi Minh City is taken along one of the expensive shopping boulevards. I was shocked by the number of upscale shops that sell bags, belts and other items made of native crocodiles (Crocodylus siamensis), which are critically endangered. Native crocodiles in Vietnam are now almost non-existent outside of crocodile farms, where they are raised to harvest their meet and skins. The United States restricts under CITES ( (the Convention on International Trade in Endangered Species of Wild Fauna and Flora) This international agreement aims to ensure that international trade in specimens of wild animals and plants does not threaten their survival. One of many upscale shops in Ho Chi Minh City (aka Saigon) that market handbags, briefcases, and other luxury items made from the skins of critically endangered Siamese crocodiles, which now primarily exist in farms. My next travel destination is Cambodia.